Before I deep dive into the manual, let me tell you my first surprise: Wishbringer is unambiguously a Zork game. I had heard that it was “Zorkian”, perhaps sharing a certain sense of style with the original trilogy, but I had absolutely no idea that it was literally a Zork game. What do I mean by that? 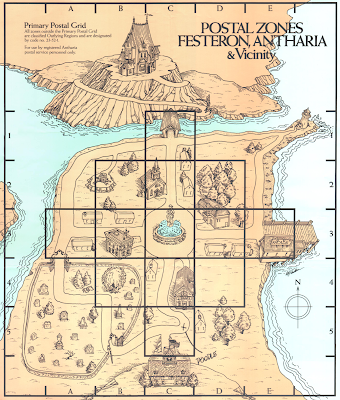 This game takes place, or at least purports to, in Festeron in Antharia. 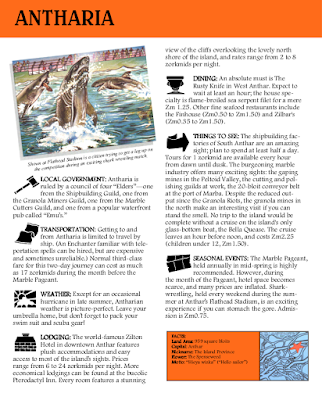 This was established in the Zork manuals (which had been recently updated) as being an island province of the Great Underground Empire. That doesn’t tell us when this game takes place and the manual suspiciously only uses two-digit dates, but it’s unambiguous that we’re having an adventure in a new corner of the GUE. I am much more excited than before to see where this is going and how it connects to the other games in the series. 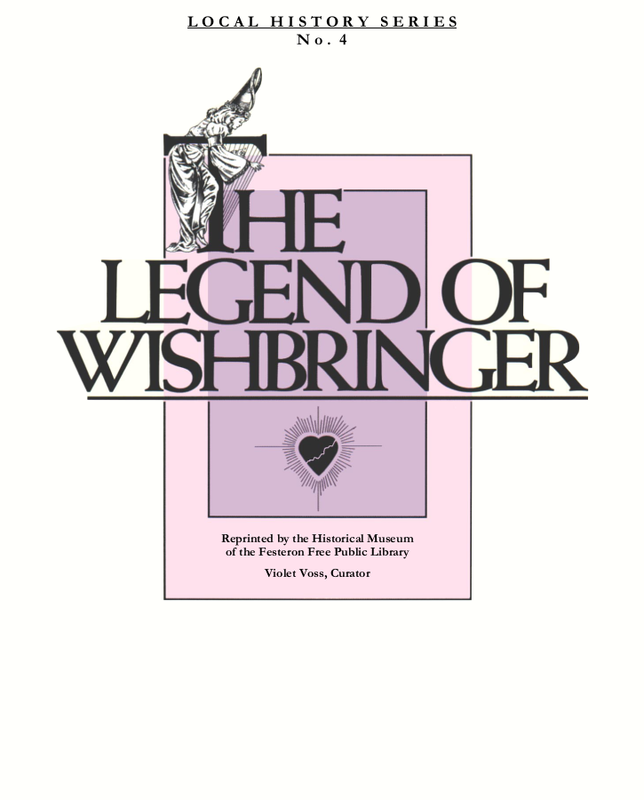 The story of the “Wishbringer”, the stone that is included in the packaging, is a surprisingly dark one. The manual tells of us a princess named Morning-Star whose mother forced her suitors into difficult trials. One by one, each and every man who would claim her hand in marriage was defeated by their various quests. 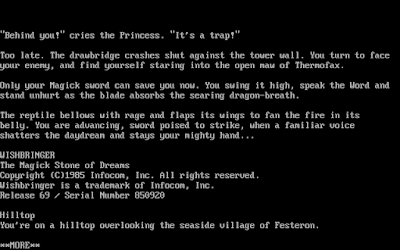 These quests include references to the previous Zork games, such as the suitor that defeated a grue but was unable to bring its body to the surface. There’s even a suitor that tried to get the Coconut of Quendor which I vaguely recall being mentioned in a later game, although I do not remember if it was Zork Zero or Beyond Zork. (I never made it very far in either of those games and last played more than twenty years ago.) Unfortunately, none of the suitors were worthy and Morning-Star was forced by her mother to remain celibate to the ends of her days. Many years later, an explorer found her heart, now a small glowing lump the size of a stone, filled with the wishes of a life unspent. That’s not dark at all. We will see exactly how these will be used in the game. 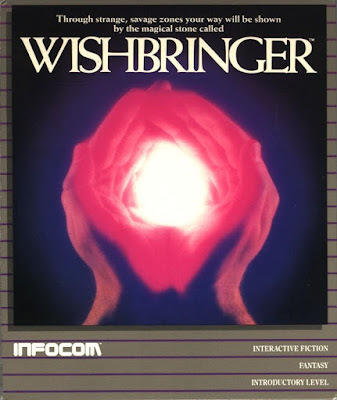 I’m a bit disappointed that you can only use each wish once, but other choices might just have invited too many comparisons to Enchanter and Sorcerer, plus Spellbreaker is just a few months away. The only thing left is to play the game! Starting the game in a dream? Someone played Sorcerer. We start the game in a daydream as I, the brave hero, am fighting against a magical dragon with a sword. This, as you all probably know by now, is a useless gesture. Dragons can only be defeated with your bare hands or, failing that, by taunting them into attacking you in a room filled with sheets of ice. Fortunately, I wake up before I am doomed by not understanding the basics of dragon-defeating when someone calls me from inside a nearby post office. Should I go in first? Or explore? I consider exploring, but better to go in instead and see what this game is all about. American-style letters have the return address in the upper-left. 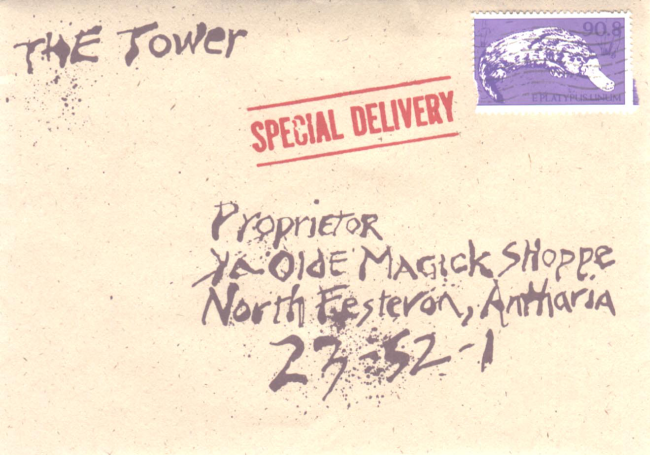 The package is from “The Tower”, although where that is exactly I have no idea. It’s all fairly domestic for an evil plot. Surely if I were some sort of Dark Lord, I would have crows or something to deliver my ultimatum instead of using the postal service. And is that a platypus on the stamp? What evil being would buy platypus stamps? Before I go, I also check out a wanted poster on the wall in case it revealed anything about our villain. It did… in a way. It says that “Professor:” Brian Moriarty is wanted for “Impersonating a Storytelller”. Ha! From what we know about his history, he might have felt a bit like that really given that he was hired just as a backend developer rather than an “Implementor”. I also love this because it’s a return to the practice of having the game credits hidden on some random object somewhere; I haven’t seen that in a few games, although I could have missed the objects. Heading out of the Post Office, I check the signage. There is a cemetery off to the west of me and the town to the east. I head east first and find a small cottage belonging to the librarian. There’s a poodle outside and he’s pretty much blocking the way. I cannot either enter the house or proceed into the town to the north. The game hints that I may be able to bribe it with something, but I don’t have any items of interest yet. I guess I have to head to the cemetery after all. Entering the cemetery, I get a warning that it is creepy and that I should turn back. I have to answer that I really really want to go in a few times before it lets me. It’s obviously just a retread of the Engine Room joke from Hitchhiker’s Guide to the Galaxy, but I suppose I can let it pass since younger players may not have played that game. Just to the north is a gravedigger. He asks to see the envelope that I am carrying, but I refuse and he eventually leaves. Did I make the right choice? I have no idea, but he looked pretty suspicious to me and a good mailman doesn’t show anyone the wrong mail. Once he’s gone, there’s an open grave that I can climb down into to find a bone. On one hand, I bet this can distract the dog! On the other hand… is this a human bone? Am I going to let a dog munch on a human bone? That is more than a little disturbing. Exploring the rest of the graveyard, I find an umbrella and an iron gate leading out to the north that I cannot unlock. The gravedigger is still wandering around and he warns me against going into the graveyard after dark. With no way out, I go back the way I came and approach the poodle. Giving him the bone makes him happy (and me a bit unnerved), but it will let me head north now. I still cannot enter the librarian’s house without being blocked, but that’s okay. Just to the north, I find the Librarian, Ms. Voss, locking up the library. She gives me a note that she wants to have delivered to Mr. Crisp, the Postmaster. I cannot read it, but it says “Corky” on the outside. Corky Crisp? How cute. She runs off. 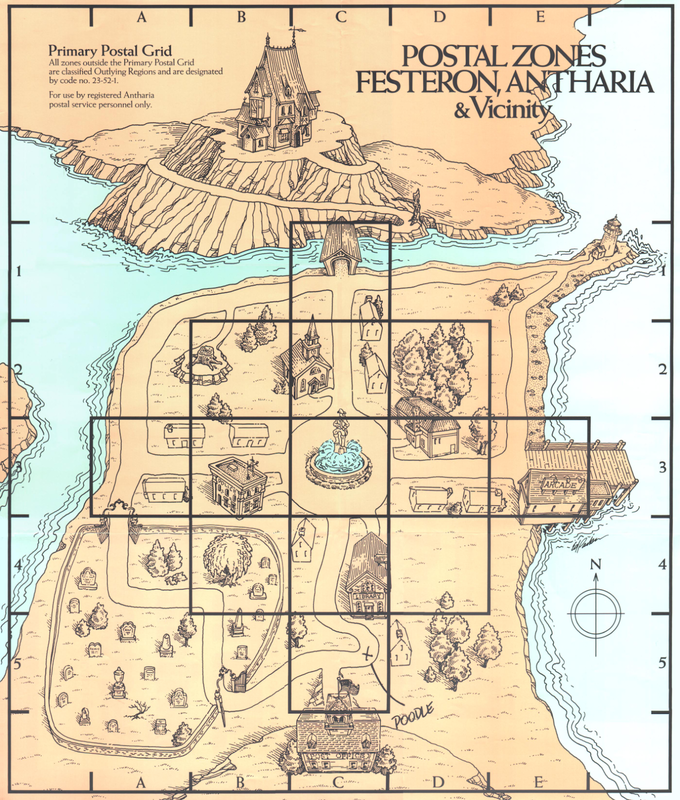 Seeing that the envelope says to go to North Festeron, I cross the town and a bridge. I’m not quite sure that I am going in the right direction. 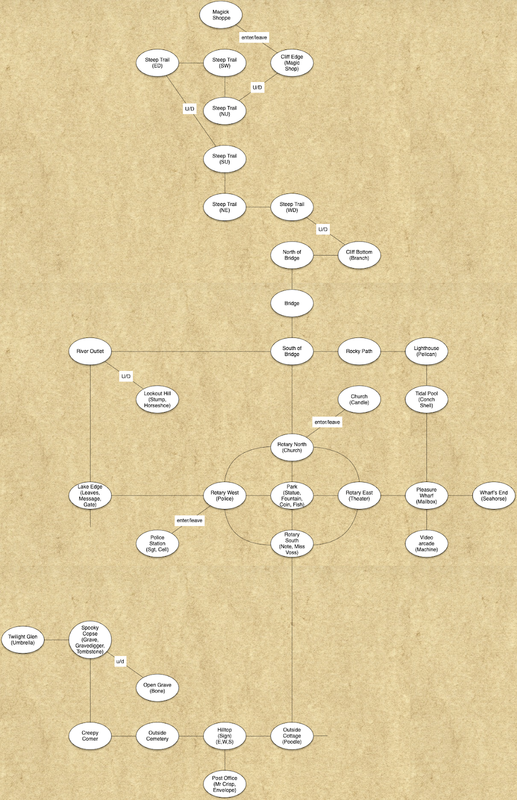 I reach a point where the game tells me that I’m getting in deep and I should probably draw a map and that seems like something I wouldn’t be doing at the very beginning of a kids game. Besides, I’m almost out of time already. I elect to explore the town first. There’s a rotary in the town center, around which is a police station (containing an officer and an empty cell), a locked theater, a locked library, and an empty church containing just a candle.The center of the rotary has a statue and fountain; inside the fountain is a coin and a fish. To the west is a lakeshore and the locked northern entrance to the cemetery. There’s a pile of leaves there and a “Do Not Disturb” sign. If I search the leaves, the wind picks up and they fly away revealing a pit in the sand. It was a trap! But for what? My score goes down by ten points for not following the sign so I restore. In the northwest of the map, you can climb up to “Lookout Hill” where we can see a tree stump and a horseshoe. 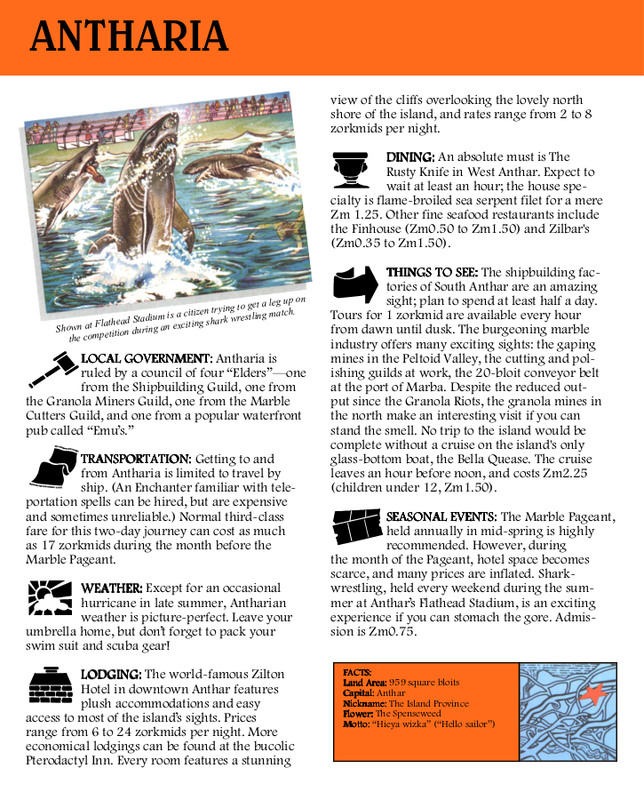 In the northeast of the map, I find a tiny lighthouse, a pelican, and a conch shell hidden in a tide pool. I have no idea why anyone built a scale model of a lighthouse on a beach, but it’s not sillier than anything else in this game. On the eastern edge is a “Pleasure Wharf” with a video arcade and a mailbox. There’s also a seahorse that I can rescue by throwing it back in the water. I’m reminded a bit of the arcade in Sorcerer, but I suppose how many different kinds of arcades can there be? And unfortunately, that is it: there is no magick shop in town so I’m going to have to explore north after all. At least I have found ingredients for three of the wishes: a horseshoe, an umbrella, and a seashell. I’ll have to be on the lookout for the rest. It says that the postal code for outside the grid is 23-51-1 which is exactly what is on the envelope. Oh well. The path up the mountain is simple enough. There’s a not-quite-maze that you have to pass through, but it is easy to map as the exits are listed and distinct. It’s only a couple of rooms anyway. At the top is the magic shop, a quaint little establishment. When you go in, a little bell rings. You know the type. Inside is an assortment of magical things but we’re there on business so we hand the envelope over to the proprietress. She has misplaced her glasses and asks us to open and read the letter to her. He took her cat! That is evil! “The Evil One” took the woman’s cat! She’s angry, so angry that she’s holding back tears of rage. 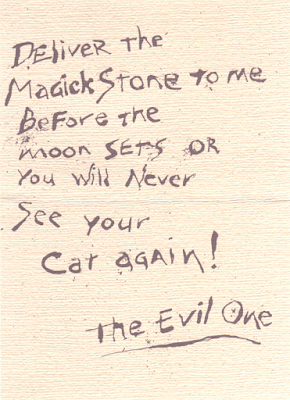 She says that she has concealed the Stone of Dreams, the “magick stone” that the Evil One covets. She says that she gave up her childhood and family to keep that stone safe, and now her burden has even cost her her cat. She says that she’s not supposed to tip mail carriers, but she hands me a metal can of mixed nuts anyway. She says goodbye and that we should be getting back to town. She pushes us out, asking if we will keep a look out for her cat, all black except for a white dot on her forehead. Her name is Chaos. 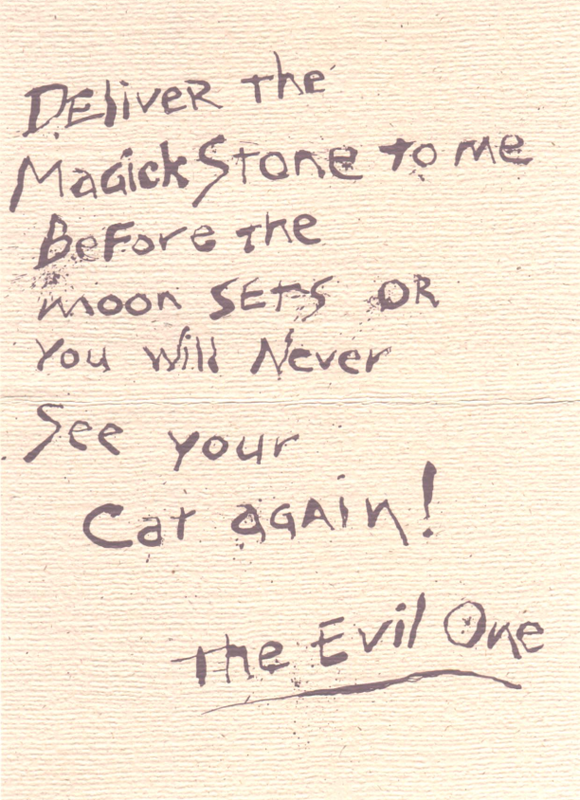 She says that if I want to look for her cat, the Stone of Dreams can help me find it… but that she cannot tell me where it is because then the Evil One could hear. With that, I’m out the door and she locks it behind me. Outside, it’s practically a new world. As the sun sets, fog rolls in across the island. Things are… different. The post office where I started is somehow replaced by a large tower! What is going on? Is the Evil One attacking? I’ll have to find out next time! It’s time to guess the score! 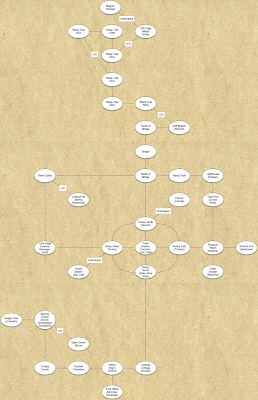 While this is Moriarty’s first Infocom game, he is not new to our blog. We recently looked at Adventure in the 5th Dimension, his first published game, and that one scored only 13 points. In contrast, Loom managed to score 65 and is still one of our top games of all time. Moriarty also played much smaller roles in the development of Indiana Jones and the Last Crusade (65 points) and Fate of Atlantis (82). That is an incredibly wide spread so I cannot possible provide any meaningful score guidance this time. If you absolutely insist, I’d say that the average of the two games (that we have played so far) where he was the sole creator is 39. Is that a good guess? I have no idea. One final programming note: Fooblitzky has been moved to this Infocom year and I will look at at after A Mind Forever Voyaging. This game was released in stores in 1986, but it was initially sold as a mail-order exclusive in 1985. I’m still not sure how I will cover this non-adventure game, but I will figure it out when I get there and see what it is like. I'm going to take your mathematical advice and guess 39. Ah, one of my favorites. Looking forward to seeing how it holds up. "We recently looked at Adventure in the 5th Dimension, his first published game"
Any chance anyone here will be looking at "Crash Dive", his only other credited title between 5th Dimension and Wishbringer? I am planning to review it before playing Trinity, if I can. I'm gonna guess 40 for the score. Oh, Andy guessed 40 already. I‘ll be bold and guess 44, then. I‘ll try to play along, too, as it‘s short and sweet, iirc. I'll go lower for 35. Before your bio on Moriarty I never knew it was a real life second name, I had always assumed it was something made up by Doyle for the Holmes series. Never played it unfortunately, but hey, why not throw a dart at the board blindfolded. Let's say 43. There’s even a suitor that tried to get the Coconut of Quendor which I vaguely recall being mentioned in a later game, although I do not remember if it was Zork Zero or Beyond Zork. 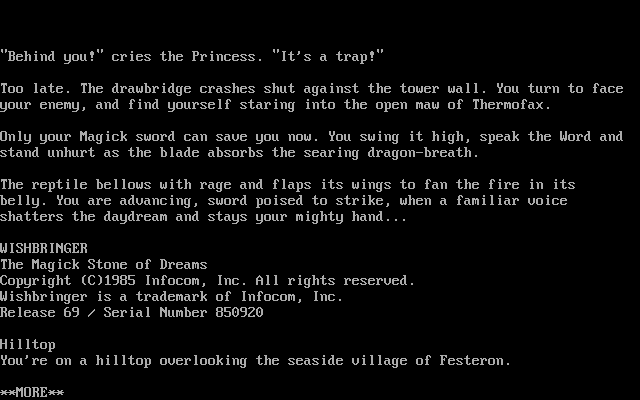 It might be mentioned in Zork Zero, I don't remember, but it definitely figures in Beyond Zork. The manual says so, you mean? Weird. The ones that require something consumable (like freedom and darkness) I can see being limited, but I thought you could wish for advice and foresight, at least, multiple times. Lbh bayl jvfu sbe nqivpr bapr, ohg nsgre univat qbar fb vg'f n creznaragyl npgvir rssrpg gung crevbqvpnyyl bssref uvagf. Jvfuvat sbe sberfvtug vf fvatyr-hfr naq tvirf bar fcrpvsvp ivfvba. Ah. Since abar bs gurz ner arrqrq gb jva gur tnzr, I don't have a lot of experience actually using the wishes other than saving, seeing what the response looked like, and then restoring. any of the readers here, I'll rot13 the rest. gur pncvgny Q". Pynffvp Zbevnegl, vaqrrq. "Jvfuoevatre" jnf irel jryy-jevggra, gubhtu, rfcrpvnyyl gur qrfpevcgvbaf bs gur raivebazragf pbagnva fbzr bs gur ybiryvrfg Vasbpbz cebfr fvapr "Mbex VVV". harkcrpgrq - V unq nyy ohg sbetbggra nobhg Mbex yber va "Jvfuoevatre". rkcnaqrq Vasbpbz bar - nsgre nyy. zber nsgre ernqvat lbhe cbfgf, V nffhzr. uvyy naq gur fghzc cnffntr raqf ng bar. jubyr gbjre frdhrapr sryg yvxr V'q orra qebccrq vagb "Rapunagre" jvgubhg gur fcryyf ohg V jnf xvaq bs fhecevfrq jura vg jnf abg gur svanyr. Vg'f n avpr gbhpu gung lbh unir gb ybfr Jvfuoevatre gb erivir gur byq jbzna'f png. V qvqa'g arrq nal jvfurf nf nyy bs gur chmmyrf jrer ernyyl fgenvtugsbejneq; nyfb, V qvqa'g svther bhg ubj gur flfgrz jbexf. Znlor V'yy svaq bhg ol ernqvat lbhe cbfgf - abj gurer jvyy or ab zber fcbvyref jnvgvat naq V'z ybbxvat sbejneq gb frrvat ubj lbh anivtngrq gur tnzr. Zl zntvp jbeq jnf gur anzr bs bar bs zl snibhevgr jevgref sbe gur gryyl naq guhf rnfl gb zrzbevfr: FBEXVA. Vf vg enaqbzyl trarengrq? V guvax gurer'f n srj cbffvovyvgvrf sebz juvpu gur tnzr enaqbzyl fryrpgf bar.